I’ve worked with the Ecuadorian communities on the plaintiffs’ side of the case for over a decade now. Though I was on a sabbatical of sorts when Chevron first made these promises, I was aware of them but didn’t think much except that it confirmed my beliefs that the company was fundamentally piggish and brutal and would need to undergo deep reforms before it would do the right thing. Looking back, I see things more clearly. For Chevron, hell froze over on February 14, 2011, the day a small provincial court in Ecuador—the sort of country Chevron in its heyday used to treat like a private hacienda—issued a massive environmental verdict against the company. The “ice,” which had been gathering for a year or so as Chevron saw the verdict coming, then followed. The scale itself is impressive, epochal: dozens of lawsuits against the Ecuadorians’ lawyers and consultants (including myself); lawsuits against every funder of the Ecuadorians’ effort, including in faraway jurisdictions like Gibraltar; a “racketeering” lawsuit against the case’s leaders that the company pushed all the way through a seven-week federal court bench trial in New York; a decade of ferocious litigation against the government of Ecuador itself, under the U.S.-Ecuador Bilateral Investment Treaty, claiming a “denial of justice” in the refusal by Ecuador’s executive branch to quash the case. All this advanced by a team that included, Chevron told a federal judge a few years back, several dozen law firms and literally thousands of lawyers and operatives. But the “ice” was more than that—colder, more biting, and more isolating than I could have imagined. It was, at bottom, a wrenching recasting of the global public narrative about the Ecuador environmental case, framing the life-long social justice activists who led the case as a greedy and villainous fraudsters, the affected communities themselves as either “irrelevant” (as Chevron has described them) or criminally complicit, and Chevron itself as the true victim of the whole situation. Chevron’s success in propagating this counter-narrative (a fundamentally false one in my view, for reasons I’ll get to) was either stunning or inevitable, depending on what you think about the depth of corporate influence in our society. Admittedly it was sped along its way by some mistakes and some hubris by the Ecuadorian team—although nothing that couldn’t be, and in fact was, “cured” by appropriate processes in the environmental case itself, and certainly nothing in comparison to what even Chevron’s staunchest supporters admit in private that you’d likely find if you were allowed to scrutinize its private files to the same extent as was allowed as to the Ecuadorian side. Chevron’s success, while certainly propagated in “traditional” means by Chevron’s juggernaut public relations and government lobbying efforts, really hit its stride through innovative deployment of private institutions not traditionally associated with public narrative processes, such as white shoe law firms like Gibson Dunn & Crutcher, and, through them, its successful deployment public institutions including and no less than the court system itself. I recognize this is a striking claim. The court system did not just roll over for Chevron—plenty of courts pushed back, rejecting Chevron’s “crime-fraud” claims against the Ecuadorians and even calling out the problematic First Amendment implications of Chevron’s counter-attack. But Chevron’s deployment of overwhelming resources changed the usual calculus of courts in the public debate. The company filed so many lawsuits that it was able to use its massive PR machine to highlight its successes and spin away its losses. It filed so many lawsuits it was able to “audition” literally dozens of judges, so that when it found a winner—such as the New York judge who began a preliminary hearing by railing against the “giant game” he thought the Ecuadorians were playing and bemoaning the influence of “imaginat[ive]” plaintiffs lawyers on the national character (“You know, we used to do a lot of other things [in this country]”)—it could double-down and throw resources in that direction. A source close to the company estimated two years ago that the lawsuit that Chevron subsequently initiated in front of that New York judge was costing $400 million per year in legal and related fees. 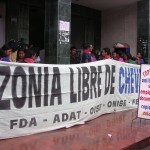 In 2009, Chevron’s lead strategist noted in an internal email that the company’s “long-term strategy” in responding to the Ecuador case was to “demonize” its opponents, in particular Steven Donziger, my longtime colleague and a social justice activist who has dedicated much of his career to the Ecuadorian cause for over two decades now. If you review the media coverage of the case and Donziger in the last five years, it’s hard not to come to the conclusion: job well done. I’ve had a lot of support from friends and family over the years I’ve worked on the case, but most of the people who support me, and who I know otherwise support the Ecuadorians in their struggle for justice, don’t even follow it anymore. They know the contamination is still there, the human suffering is still there. They just don’t recognize the headlines. And from some people who used to support the case, or who I would have thought would support the case, there is an icy silence. But the ice may, finally, be cracking. But conversely, if the Second Circuit vacates the racketeering judgment—and oh my does it have plenty of good reasons to do so—the significance of Chevron’s racketeering case pivots. It still remains relevant, but not as a question of what the Ecuadorians did or did not do in Ecuador. It becomes a question of what Chevron did, on a global scale and at mind-boggling cost, in responding to its Ecuador liability not by taking responsibility but by instigating a massive retaliation campaign against its own victims based in large part on distorted, even invented evidence. This is not an overstatement: as has been discussed elsewhere and will be detailed in future blogs, Chevron literally paid cash to “fact” witnesses for key testimony that it must have known could not be true, and that emerging evidence may conclusively prove to be untrue. Our federal courts’ and our society’s willingness to embrace Chevron’s counter-narrative, even temporarily, raises important further questions. In my view, it speaks to our persistent longing to believe that our society’s most powerful private institutions—not just oil companies and white shoe law firms, but, in other contexts, big banks, media conglomerates, technology companies—are “too big to lie,” are fundamentally good at heart, or otherwise can somehow be trusted to protect the public interest even as they pursue their private ones, without the draining exercise of regulation, enforcement, and constant public vigilance. It is a longing that gets us into trouble again and again. The Second Circuit will hear argument in the case on April 20. There are very good reasons why, just on legal issues alone, the Second Circuit it likely to reverse the racketeering judgment. After boasting for three years that it would take its racketeering case to a jury, Chevron dropped all its money damages claims on the eve of trial, allowing it to submit the case for decision solely to the “we-used-to-do-things-in-this-country” judge, not a jury. But dropping damages left Chevron asking for a civil racketeering verdict based on forms of alleged injury more like hurt feelings than the sort of things that federals courts say are necessary for a plaintiff to have “standing” to proceed. Chevron argues that because it asked for damages at the beginning of the case, it should get a pass on standing even though it later changed its mind. That one’s not going to work. Another glaring problem for the Second Circuit is that if Plaintiff Chevron is allowed to use the civil RICO statute as it has, an army of more typical big-money plaintiffs lawyers would use the precedent to bring actions against corporations without the hard work of proving damages, because under RICO they can recover triple attorneys fees even where no damages can be found. The Second Circuit would turn into a haven for racketeering cases. The law on this and a ton of other issues is so bad for Chevron that even it has started positioning itself for defeat. As I noted in an earlier blog, Chevron recently pleaded for the Second Circuit, even if it reverses, to leave a portion of the judgment in place as a “freestanding determination of the facts,” even without legal consequence. A nice idea—but completely unconstitutional, so long as the normal standards are being applied. Also very unlikely in light of new developments in the form of new evidence, admittedly outside of the trial court record , which appears to conclusively show that Kaplan got the facts wrong. Kaplan “found” that Ecuadorian judge Nicolas Zambrano did not author the Ecuadorian trial judgment but took a bribe to put his name on a judgment authored by the plaintiffs. But a forensic analysis of the Ecuadorian judge’s hard drives apparently shows him writing the judgment, day by day, over the course of the months. Even though Chevron is likely adapting its fraud theories to the new information as we speak, it is devastating to the company’s counter-narrative across the board. What’s more, in Chevron’s massive international arbitration directly against the government of Ecuador, it has gotten everything it has asked for from the panel of arbitrators—until last week. The arbitrators (who are convened by corporate investor complaints, even if they are sometimes appointed by States, meaning that they generally have an incentive to enhance the effectiveness of the arbitration forum for corporations by ruling in their favor) issued a pre-trial decision analyzing what has been Chevron’s primary defense/argument not just in the arbitration but in collateral litigation around the globe—in Ecuador, in New York, in Gibraltar, and in enforcement courts in Canada, Brazil, and Argentina. The arbitrators concluded that the defense—that the Ecuadorians could not pursue their claims because they were barred by the terms of a 1995 release agreement Chevron worked out with the Ecuadorian government—was lacking. The result is devastating for Chevron; the arbitration that was started as a way of bolstering its position and influencing the national-court jurisdictions that actually matter, has now turned into a liability in and of itself. An arbitration trial on Chevron’s “fraud” facts—which as noted, are unraveling—is set to start April 20 before the same arbitrators. Finally, there are rumors that the Supreme Court of Canada may soon authorize the Ecuadorians to begin a full-bore enforcement effort against Chevron in Canadian courts. Other efforts to enforce the Ecuadorian environmental judgment in various countries that have been stuck in the ice the last five years are likely to break free and start moving too. I’ll have more to say on these and other developments as we head into these important dates in April and beyond. The charges said that McDonald’s and its franchisees illegally disciplined employees who had protested, reduced their hours, spied on them and restricted their ability to communicate with union representatives. Ouch. You would expect a outraged denial from the company, right? At least a statement saying that such conduct, even if McDonald’s denies being liable for it, is unacceptable. McDonald’s said that the general counsel’s action “improperly and dramatically strikes at the heart of the franchise system — a system that creates economic opportunity, jobs and income for thousands of business owners and their employees. And then it lets its thugs at the U.S. Chamber of Commerce, the International Franchise Association, the National Restaurant Association and the National Retail Federation do the talking, without a word on the merits, simply “warning that [the NLRB action] could result in the loss of hundreds of thousands of jobs by forcing franchising companies to rethink and reduce their number of franchised outlets.” Blah blah blah. The idea that McD’s and others would lay off hundreds of thousands of workers and close thousands of restaurants because they have to take some responsibility for franchisee labor conditions, when they already exercise dictator-level control over marketing, promotions, and countless other operational details, is patently self-serving and melodramatic. But my real point here is how neither McD’s nor any of their linemen even feel the need to address the incredibly serious allegations of rights violations behind the NLRB lawsuits. It appears to have become perfectly acceptable to stand on your impunity defense with nothing more. This was always the case in court, but if it’s now the case in the court of public opinion, it makes for a sad statement on where things stand.